So here goes the second part of the empties. I am completely obsessed with the entire Organix line of haircare, especially their range of shampoos. This one is an amazing shampoo if you want to bring some instant shine to your hair. When I first started using it, my hair immediately reacted to it in the first shampoo itself. I had never felt my hair so nourished, shiny and healthy looking. I started using this shampoo to restore my hair to some of its former glory which was lost due to heat styling and what not. It doesn’t have a significant scent to it, which is good because it is neither an offensive nor an overpowering smell. I highly recommend this product. It is super affordable and easily available at a variety of drugstores, the Walgreens around me carries this range. I cannot even begin to rave enough about this fragrance. You know when you wear a fragrance and get asked by every other person what you are wearing-yes, this is one of those. It just the freshest floral scent ever. I suspect it is the freesia that packs in that special punch. The price is also not going to break your wallet. Wait for one of those Buy 3 get 3 free sales and you’ve scored yourself an amazing deal. To be honest, I would purchase this fragrance even at twice its current cost. I have gone through at least five of these, which is a feat considering how much I love experimenting with new fragrances. This face and body scrub is a bit of an anomaly for me. When I first started using it, my skin absolutely loved it (I mainly used it for my face). I mean, love love loved it. My skin had never been brighter and clearer. However, maybe a month into using it, my skin just stopped reacting to it and eventually it started breaking me out. This could be just my freak skin. However, if we talk about the good phase, this scrub was heaven. I loved the gritty texture and it left my skin squeaky clean. I have always loved charcoal cleansers and this was no exception. One thing to keep in mind is, this is one of those Lush products that expires pretty quick, so you have to be speedy in using it up. It is a little bit on the pricey side, so a DIY homemade scrub can work just as well. You know when you walk past the coffee aisle in a grocery store and it smells so wonderful with the delicious scent of coffee? Imagine that feeling packaged into a body scrub. I am not very picky with my body scrubs as long as they do the job and smell good. This met all of those requirements and is easy on the pocket too. Available at many drugstores including Walmart and such. This eyeliner was purchased when I went back home to India. The name and description on the package has rubbed off completely and I couldn’t find this online either. However, I remember being peeved with this eyeliner because it smudges like none other when you put it on your lower waterline. Because I hate seeing a product go to waste, I used it up as an eyeliner which could then be smudged out on the lids for a soft and subtle smoky look. Nothing too special about this one. The texture of this exfoliant is very similar to the Épicé one that I described in my previous post. It has the perfect balance of softness and grit so that it works to create clear, dirt free skin. I recieved this sample in one of my ipsy monthly bags and I love it. 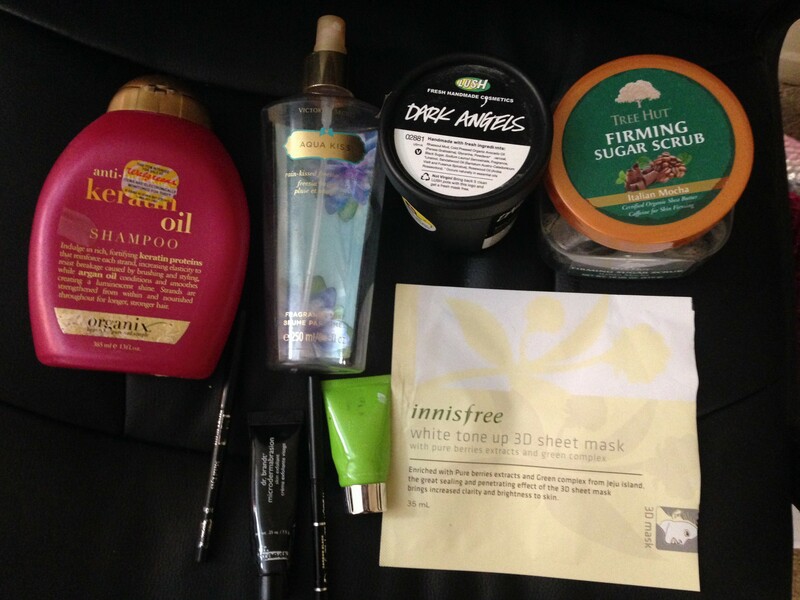 I received a couple other products by the same brand and I am liking everything so far. It is also great to travel with, since the skin can become dry and lifeless during travel and this is the perfect mini to carry with you. I have loved most L’Oréal eyeliners and this one is no exception. I am partial towards retractable eyeliners and I rarely like eyeliners that need to be sharpened. So this one was right up my alley. It is dark, it is intense and it is creamy. There is a little bit of smudging that occurs as you wear it through the day. However, if you are an avid user of eye primers, this shouldn’t pose a problem for you. It is a good drugstore option, not my most favorite liner at the drugstore however. I am partial to the Maybelline Master Drama and a Milani one that I can’t for the life of me remember the name of. This product is a dual product in the sense that it is applied as a mask first, and when you wash it off, it turns into an oil treatment. I like Glamglow as a brand in general, however, I don’t know that this did wonderful things for me. I used the mask whenever I felt like I needed to soak up any excess oil on my skin. It is similar to many other clay masks out there and I don’t think I would splurge on a full size of this product. I would rather try the Glamglow original or the Glamglow hydrating treatments. I saved the best for last. My sister and I bought a range of Innisfree products while we were shopping in Singapore. I geared more towards the variety of masks that they had to offer and she more towards their range of serums and such. I am yet to pick her thoughts on how the products performed, but this mask is divine. We all know most masks aren’t something that make any visible difference to your skin, they are mainly a pamper essential. However, the moment I put this mask on, it was like I had stepped into nirvana. It was the most cooling and soothing sensation, and it was pleasure to leave the mask on my face for 15-20 minutes. After I took it off, I massaged the residue into my skin and thirty minutes later, my skin looked so healthy and radiant, I couldn’t believe my eyes. Highly, highly recommend this.